After the year and a half of volunteering as an English teacher at Bangkhonthiinai village, I became very familiar with Samut Songkhram province – Thailand’s smallest – and especially the weekend nighttime floating market in the town of Amphawa. My debt of gratitude to Ajarn Yai, the former director of the school, is deep as she has been a gracious host anytime I have guests to bring to the floating market. Ajarn Yai arranged and paid for a canal and river tour in the late afternoon, following a route that took us several kilometers down the Mae Khlong River and then cutting back through the smaller canals until we returned to the market area in Amphawa. It was a fascinating opportunity to show Bruce “life by the water” – a fixture of central Thailand and an important cultural touchstone as so many references in language (and even driving habits!) can be traced back to Thais’ relationship with bodies of water. Since Ajarn Yai insisted on paying for the boat ride, Tawn and I insisted on paying for dinner afterwards at a riverside restaurant. Not without a big fight, though: “I’m your big sister!” she protested, pointing to Thai custom that the puu yai – senior person – pay for dinner. As I’ve explained to her several times, I can’t let her pay every time we have a guest in town; that’s not fair to her. Of course, “fair” is a very different concept in my mind than in hers. For Ajarn Yai, “fair” will be when we finally take her to the United States for a visit. Long before Bruce arrived, we had discussed a road trip to Thailand’s wine country – Nakhon Ratchasimaa province, also known as Korat. Yes, we do have a small wine industry and as we found out, they produce some decent wine. 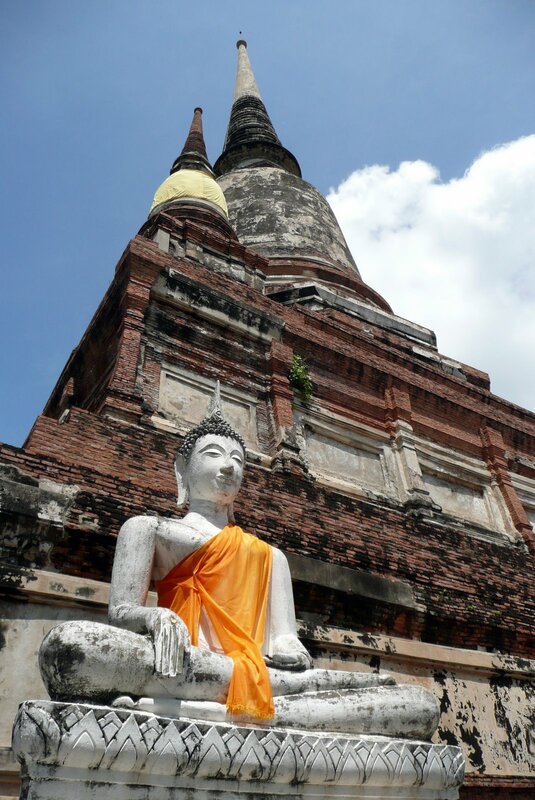 We started out in Ayuthaya, the second capital of the Kingdom of Siam. Located about ninety minutes north of Khrungthep, the city is full of ruins including a UNESCO World Heritage Site. Our first stop was Wat Yai Chai Mongkhon, above and right, on the south side of the city. Quieter than many of the other temples, it was famous as a place for meditation and still houses a large community of monks and nuns. The large chedi or stupa is still intact and you can climb it for quite a view. 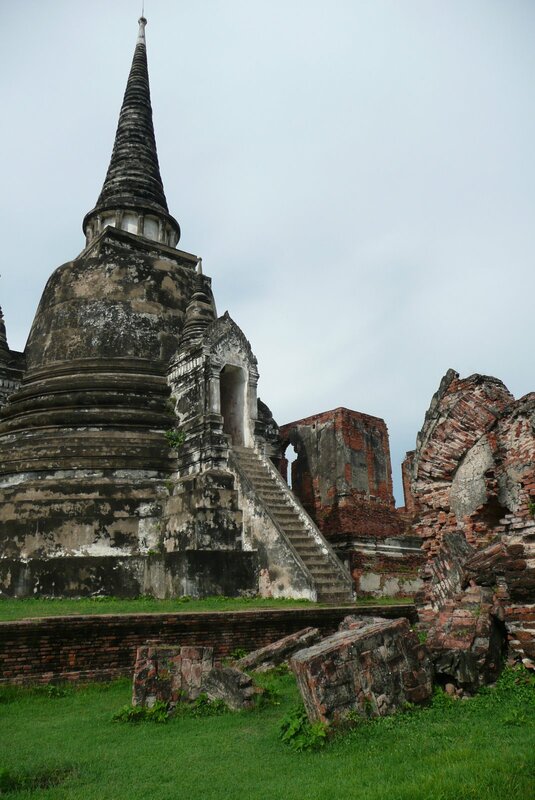 After lunch and a stop at the Ayuthaya Historical Study Center, a decent museum that helps put the ancient city into context, complete with scale models of how the city looked before it was ransacked by the Burmese in 1767, we headed to see some of the ruins. In the 17th Century, the city had a million inhabitants and strong trade relations with the Dutch, Portuguese, English, French, Chinese and Japanese. Many Western visitors remarked how illustrious the city was, with the temples and many palace buildings decorated in the same fashion in which Khrungthep’s Grand Palace is. 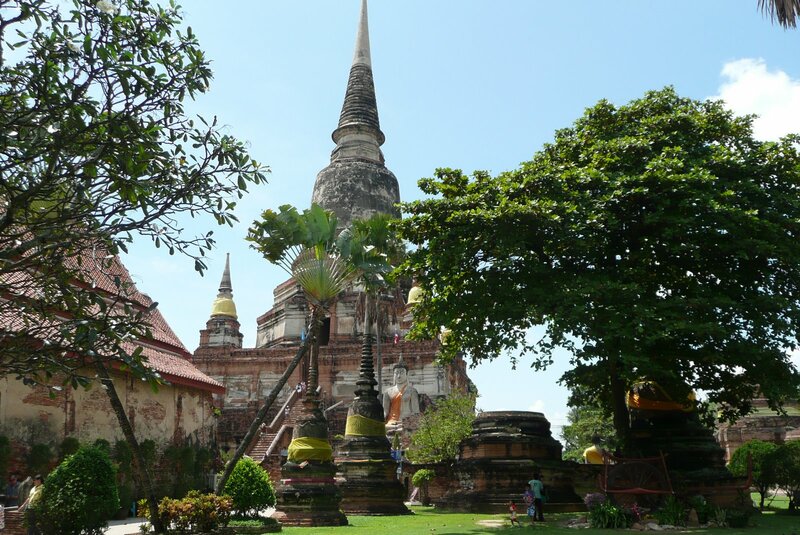 Back out into the warm pre-thunderstorm afternoon, we visited Wat Phra Si Sanphet, once the largest temple in Ayuthaya. This is the famous one with a trio of large chedis still standing in a row down the center of the park. The surrounding walls have tumbled down, whether a result of the Burmese cannon fire or just a matter of time and weather. There were surprisingly few visitors and Bruce was able to film a lot of video footage on his new camera while Ken and I tried to remain in the shade of the magnolia trees. Afterwards, we stopped at a nearby market to watch the making of roti sai mai – a dessert popular among the Thai Muslim population with thin pandan leaf flavored crepes are stuffed with spun palm sugar – and, of course, to eat some. Our last stop in Ayuthaya was the elephant kraal. North of the city, this is where the wild elephants were herded so ones could be selected for use in battle. 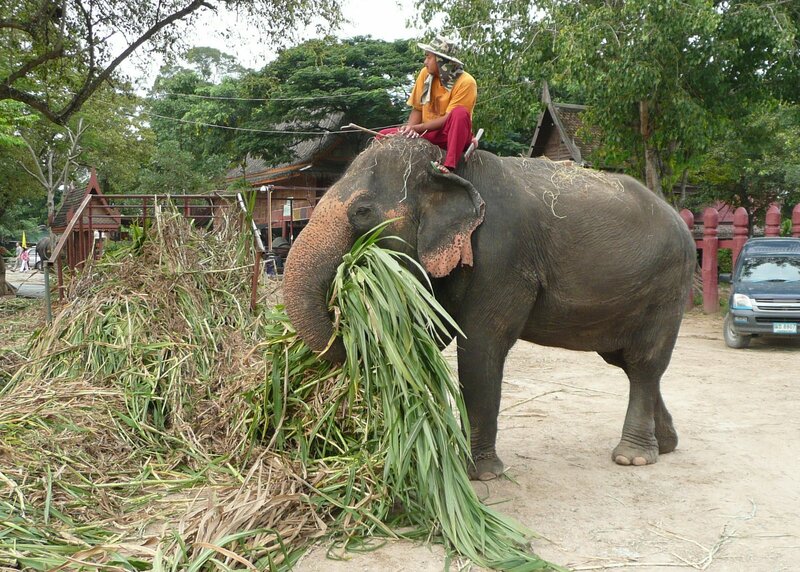 Today, it is where the elephants that visitors ride at the historical park are housed, bathed and fed. Run by a pair of farang women, there is a program where guests can stay several days in cottages and learn more about the elephants while helping out with the chores. We arrived at feeding time, with a pair of elephants unloading pickup trucks full of grass and bringing it to the other elephants. For the most part, it looks like the grass is ground up before being served to the elephants, using a cement mixer as a gigantic food processor. The elephants that were doing the heavy lifting occasionally snagged a few blades as a snack, having to be urged back to work by their mahouts, or guides. A baby elephant gets a shower while playing around and trying to drink the water. We found a relatively new tourist class hotel. It was clean and the beds were comfortable, so for 700 baht a night (about US$20) it seemed like a pretty good deal. This far outside of the big cities, I think our options are limited. The receptionist suggested a really nice restaurants that is located on the banks of a small river. Decorated along the lines of a Cracker Barrel restaurant, the restaurant served pretty good northeastern Thai food, although the grilled chicken was a bit tough. 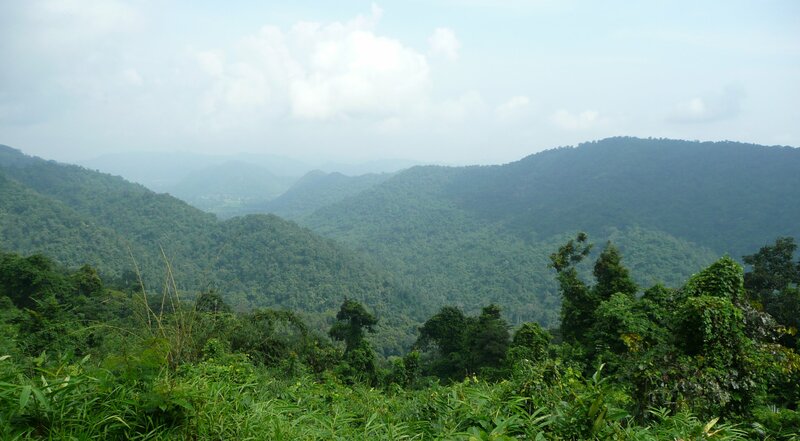 Tuesday morning we started out early and drove the hour up to Khao Yai National Park. We were afforded gorgeous views and lots of lush foliage. From a view point looking north back towards Pak Chong. There is a lot of wildlife in the park, including a herd of 200-300 wild elephants. While we didn’t see any elephants, we did encounter several other animals including a few monkeys and deer. At one stop, there is a salt lick that “Friends of the Park” – a volunteer organization – created so that animals would have a place to eat their minerals in good view of the road. The salt lick is shown above and below is the accompanying warning sight at the viewing point. 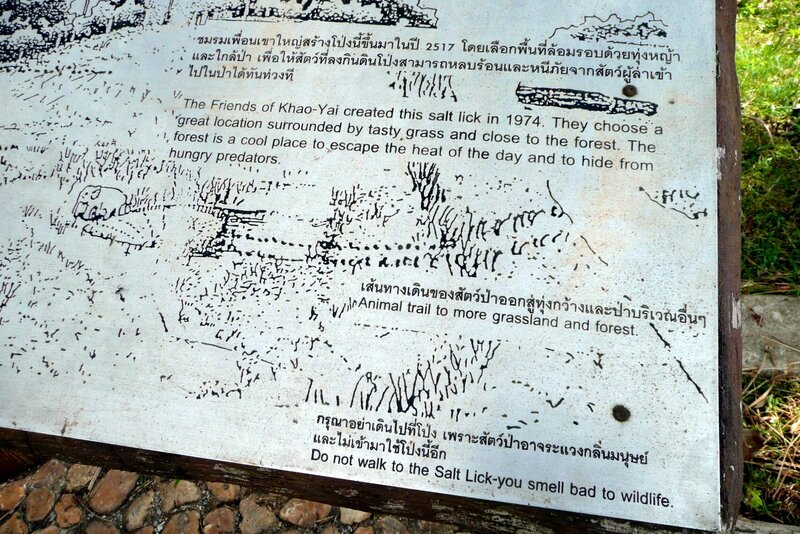 It reads, “Do not walk to the Salt Lick – you smell bad to wildlife.” Ain’t that the truth? After stopping at the interpretive center we decided to take a short walk behind the center to see a waterfall. Our information was bad and we ended up taking the long way around. Imagine, if you will, that the interpretive center was at noon on a clock face. We started walking along the trail, only to eventually discover that the waterfall was at the eleven o’clock position, which we could have easily accessed if we had walked the opposite direction! 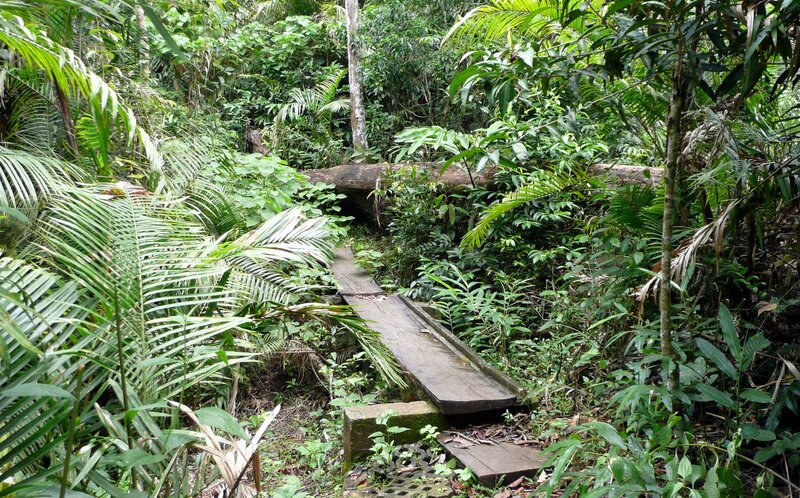 The trail was overgrown and in places, completely veered off into uncharted territory. 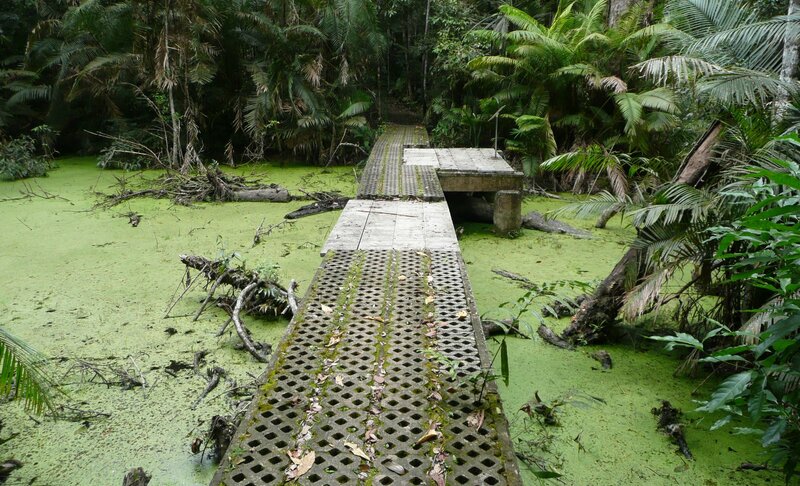 Along the way, we discovered a bit more of the local fauna than we wanted to: leeches. 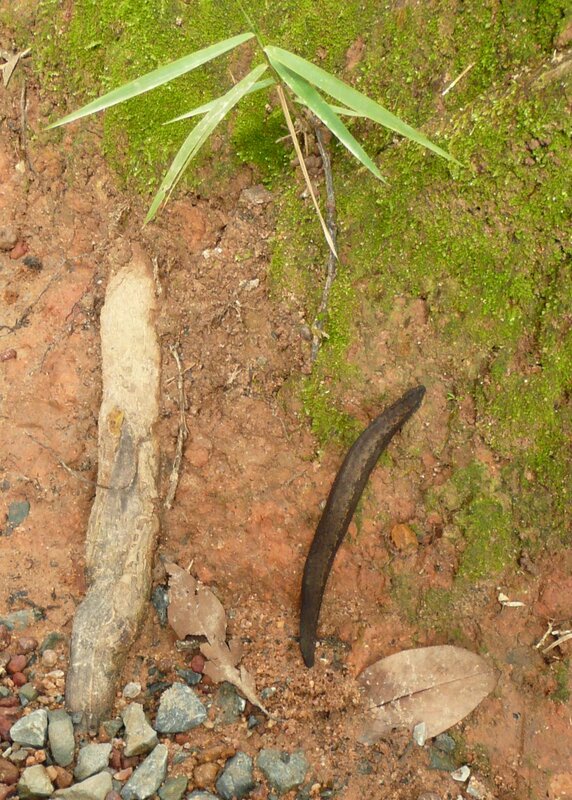 Here’s a view of the leeches we acquired and the larger ones we managed to avoid. Mostly small but those things really have a strong grip. One burrowed through my sock and was pretty firmly attached to my leg. Five days later, I still have a purple welt from where its mouth was. The further we went, the more precarious the trail became. To be certain, the forest there is beautiful and cool, but if we hadn’t heard the sound of a waterfall in the distance, I think we would have turned back. We arrived at the waterfall and were terribly underwhelmed. There are probably several in the park that were much more spectacular, because this one was more of a large rapids than anything else. As waterfalls go, I think the Erawan Falls in Kanchanaburi province are much nicer, especially as I didn’t encounter any leeches there. Sadly, Bruce was the most affected by nature, suffering at least a dozen leech bites and having to pull them from between his toes. 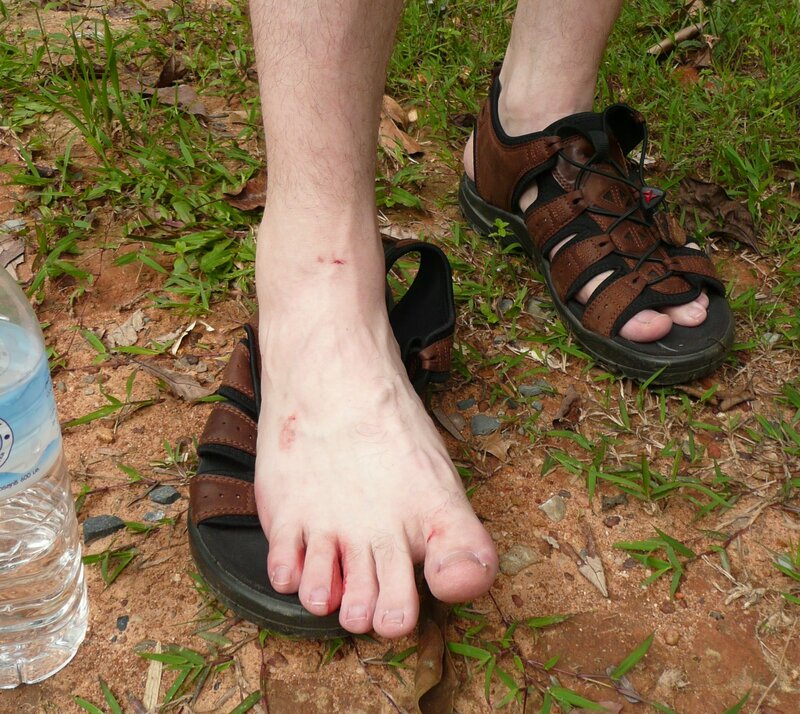 Let this be a lesson to all of us: no shorts and sandals when you are in a national park. On our way in to the park, we saw several truckloads of tourists who had these leg warmer type of padding around their legs, even though they had long pants on. I thought perhaps they were protection for snake bites but realize now that they were designed to keep leeches off you. Tough way to learn the lesson but glad we know that for next time. After Bruce had had enough of nature we headed down the mountain to search out a pair of wineries. They were pretty easily found and, sure enough, as you get up into that region and drive down some of the two-lane roads, you could easily imagine that you are in Sonoma County, the Barossa Valley, or another wine producing region. Above, vineyards at PB Winery. The higher-end shiraz was pretty decent, albeit pricey. The lower-end shiraz had the bouquet of molasses and was so young as to be nearly illegal. The drive is pretty, though, and it was interesting to see what this nascent wine region is producing. By this point in the afternoon, we were hitting some rain and decided to make one last stop before heading back to the Big Mango. Our destination was Chokchai Farms, a large cattle and dairy operation near Pak Chong. Left, traditional “old west” farm architecture amongst the tropical foliage. Chokchai is the most modern and productive cattle operation in Thailand and ostensibly their cows get a lot of opportunity to pasture, although I wasn’t able to take the farm tour thanks to the monsoon rains that arrived. Instead, we hunkered up in the Chokchai Steakhouse and enjoyed a good steak lunch with inexplicably overcooked vegetables. Really, they were aiming for Midwestern US cuisine with frozen carrots and green beans that had been boiled to death. Only the steamed cabbage and daikon radish were fresh. We returned to Khrungthep around rush hour, leaving unexplored many other parts of Nakhon Ratchasimaa province that I’ll have to return to in the future. 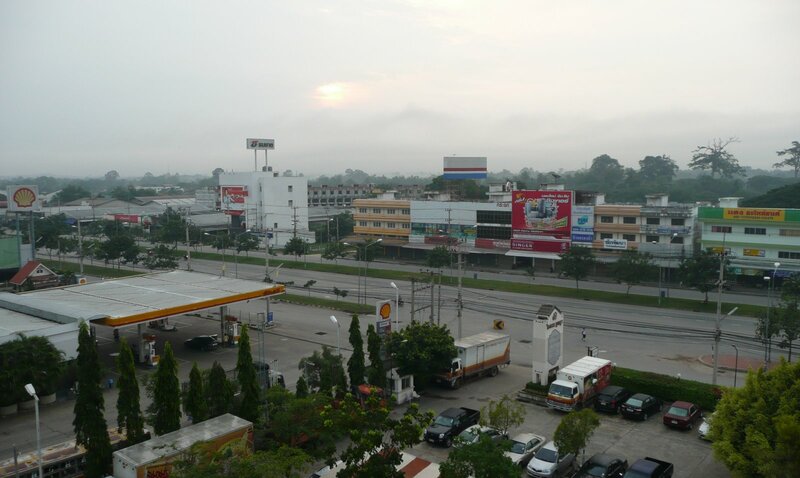 In particular, the capital city of Korat, about which I’ve heard good things, deserves some exploration. This entry was posted in Thailand, Travel and tagged Ayuthaya, Elephant, Khao Yai, Korat, Leeches, National Park, Thailand, travel by christao408. Bookmark the permalink. Staying with those ladies and helping out with the chores of taking care of the elephants sounds a bit like WWOOFING. And the baby elephant! HOW CUTE!I hope you’re recovering from the attack of the leeches!! Looks like a great little adventure outside the big mango. The baby elephant is so cute. Fabulous post Chris. Hope Ken has recovered from his hurty. Poor baby. Leeches!? ICK! Kinda glad we skipped those nansty things while we were there. 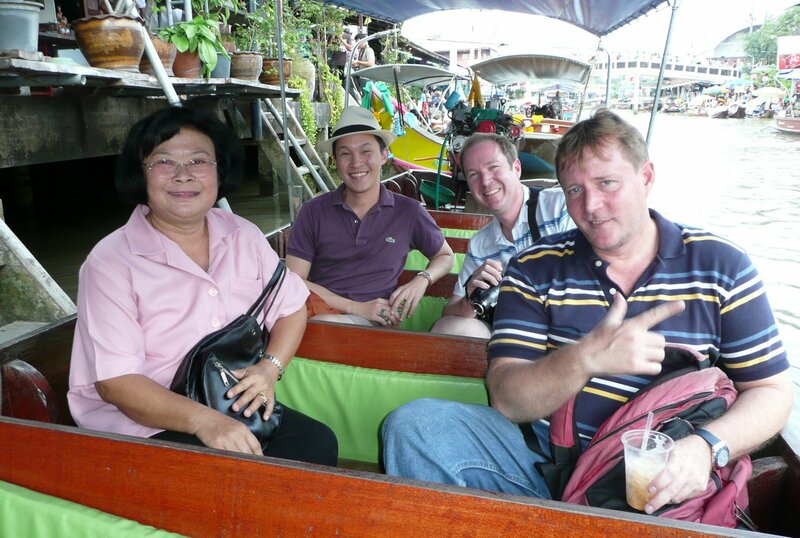 @lcfu – Interestingly, it was a different floating market than the one you and I went to. @brooklyn2028 – Yeah, it did sound like your farms program. Thankfully, I was mostly unaffected by the leeches. Guess I don’t taste so good. @doiturselfer – Yeah, there are many interesting things to see outside the city. Well worth doing some more exploring. @zacksamurai – There were a half-dozen babies up there; seems like the elephants are mighty (re)productive these days. 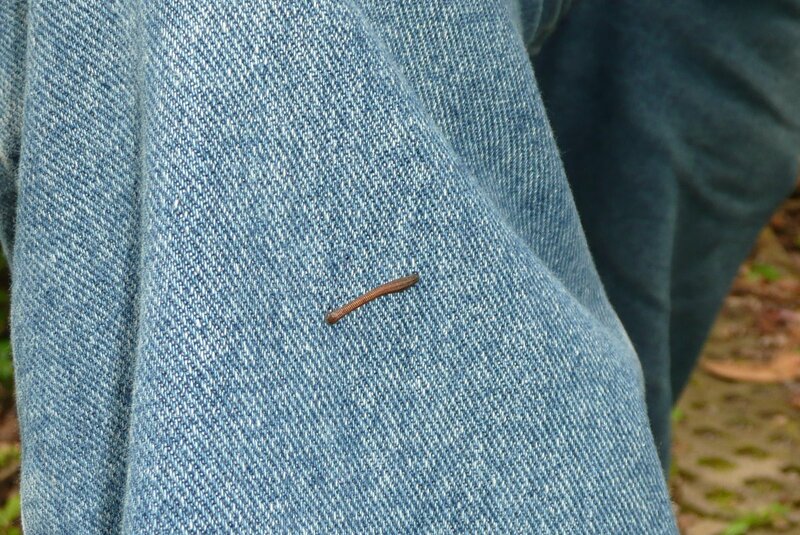 @stebow – I’m glad we didn’t encounter any leeches on your visit, too. Terriofic photoessay! 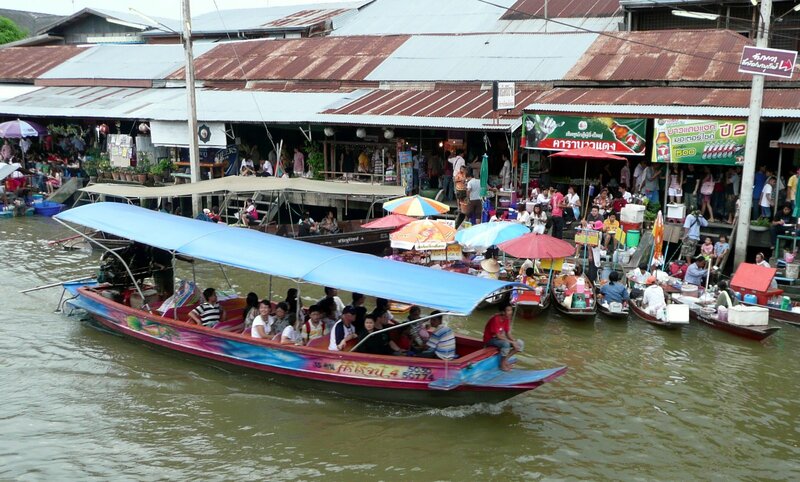 I do remember the floating market from by visit on R&R back in 1968. I have heard though, that most of the canals are now gone – true? The leeches look just like the ones we would encounter in Vietnam, but honestly never in the quantity that you your party found (or should I say “that found you.”) The national park seemed indeed quite dangerous – but fortunately no tigers! I heard about new coffee shop decorated in Italian garden style there by Khao Yai. So many cool places there to visit actually. 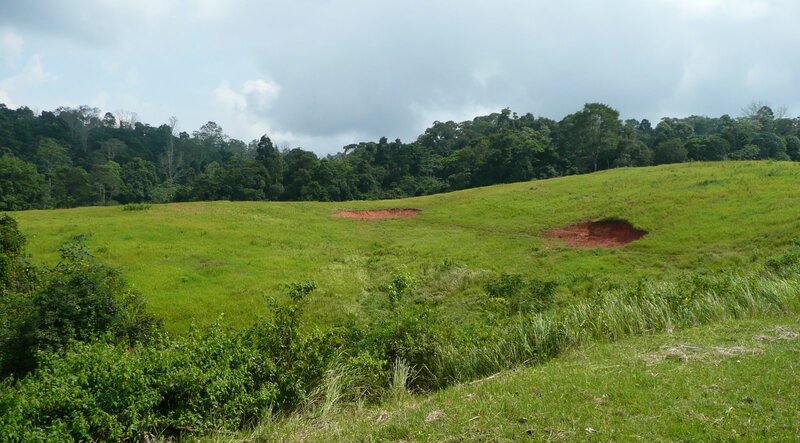 I miss Khao Yai and think about going back there sometimes soon. I was supposed to come to Bangkok on a business trip earlier this year (because of budget cuts, some of our group could not go, myself included). One thing I really, really wanted to see was the floating markets because I had read about them in some of the tourist guides. One of the co-workers who went knew how much I wanted to see them and brought me a little wooden replica of the boats. @RakkaRay – Ray, within the cities, some of the canals have been filled in to make roads or are no longer used. 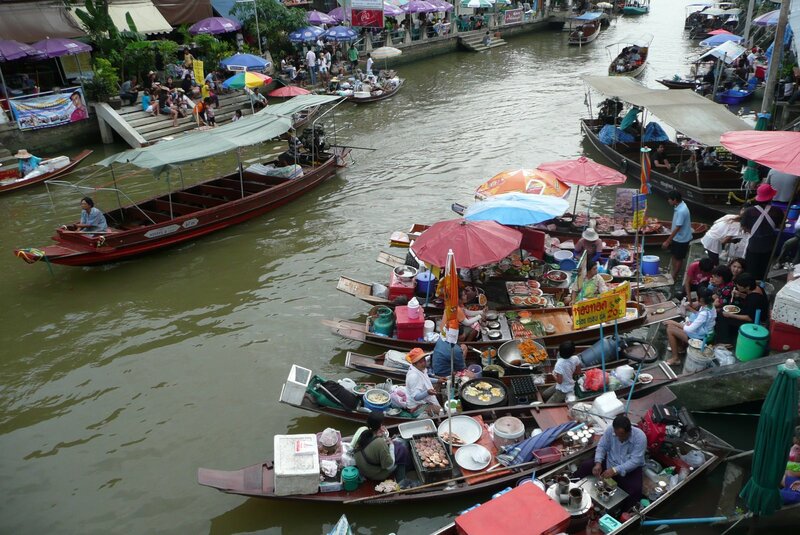 Outside Bangkok, the canals still exist but most of the markets are on land. There are a few exceptions in smaller communities, but the floating market isn’t really a part of everyday Thai life anymore. Such a shame as it is a very unique tradition. Still, there are some vestiges of the past like this market that are worth checking out. @blue_beau – Yes, it is called Primo ______ (can’t remember the full name). We stopped by to look but it is only open Friday-Sunday. Smaller than you might expect but very beautiful. There was a party there taking wedding photos. It is very close to PB winery and Granmonte winery, on the same main road, in fact. Tawn and I will have to take another trip back one of these weekends. @TheCheshireGrins – When you do have the opportunity to visit, let me know and we’ll make sure you get to a market. The one that people usually go to is terribly geared towards western tourists. That one is called the Damnoen Saduak floating market. A better one is the one we went to, the weekend nighttime market in Amphawa. It is geared almost exclusively towards Thais. Another option, although smaller, is the weekend daytime market in Phra Phadaeng. Much closer to Bangkok but there isn’t really any floating. The entire market is in booths alongside a canal.